Little Books for Little Cooks ~ How Many Snails? Are you having fun teaching numbers, letters and shapes to your little tots? Me too. It's fun to watch them learn. I like to learn new things too. For my own crazy fun, I decided to research the origins and history of shapes. There are three beliefs about how the heart shape came to be. Because I know how valuable a mommy’s time can be, and because I think there is a message in it for Moms, I am deciding to forget the first two possible origins and focus on the third. In 7 B.C. there was a little seed called the Silphium. It was a spice belonging to the parsley family and it was used for cooking and medicinally. Silphium is extinct today. However, in its day, it was a hot ticket item among Egyptians who traded the seed and even printed its shape onto their money. The seed looked exactly like our traditional heart shape. Today, we see the heart and we automatically associate this shape with love. Imagine if we could time travel. Picture yourself in a marketplace in 7 B.C. watching heart stamped coins being exchanged. To us, it would seem they were trading love. We would marvel at the thought. Trading love? As if it was something that could be earned, bought, or sold. What a silly thought. 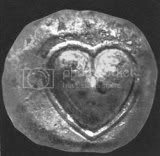 Silphium no longer exists, but we still trade love today. We trade love by giving and withholding affection when we feel it has or hasn’t been earned. Moms do this often, and it is very dangerous. When my little ones fail to obey or they embarrass me through their actions or behavior, I can feel my love get cold. I don’t feel like hugging my little ones when I see that they’ve drawn on the wall again or stolen candy from the not so secret stash in the kitchen. But when I’m getting something positive from them I feel differently. When they pick me a flower from the yard while they are out playing, or they draw me a picture in all my favorite colors, I can feel their love and I give it back to them in abundance. My favor and affection is too often tied to what I’m getting out of the relationship. Aren’t you glad that God doesn’t think this way? His love isn’t traded for His benefit and it doesn’t waver when we fail to meet His expectations. He loves us even when we frustrate Him. He laid down His life when we didn’t deserve His sacrifice. He loves us when we are rotten and un-loveable. It’s constant and it isn’t for sale. It’s freely given to all who would accept it. Wow. Time and time again David called on God to show his unfailing love. He knew that God’s love couldn’t be shaken. It could always be counted on. While we were scribbling on creation and mocking all things holy, Christ DIED to show his love. Yeah, I’d call that unfailing. His favor was undeserved, unmerited and most often unappreciated but he didn’t hold back. Silphium is extinct. We moms really need to stop trading our love, making our children work to earn our favor. I’m going to strive to give my family a God- inspired unfailing love that doesn’t seek its own gain. Let's hug them really tight. Wow. Great reminder on the morning of Advent. It's easier just to give in to our humanity. Thanks for inspiring me to challenge those love-trading reactions and replacing them with love-giving responses! Awesome post! A very good reminder for me.